Thief II: The Metal Age is the second game in the Thief series. Players once again assume the role of the charismatic burglar Garrett - a master at his chosen profession who has gotten mixed up in a plot that begins with the local officials but soon points to something much more sinister. Players coming to this game from the original Thief will notice an increased focus on stealth and stealing this time around. The missions are much longer and the levels larger, with many available options for reaching your objectives. 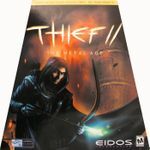 Although Thief II takes place from a first-person point of view, that's where the similarities between this title and those in the FPS genre end. The Thief series is about avoiding contact, sticking to the shadows, moving slowly, and only resorting to force when absolutely necessary.